Fire Grounds Hundreds Of Flights At Chicago Airports : The Two-Way The fire in the basement of the Chicago Air Route Traffic Control Center in Aurora, Ill., caused numerous flight cancellations at O'Hare and Midway. 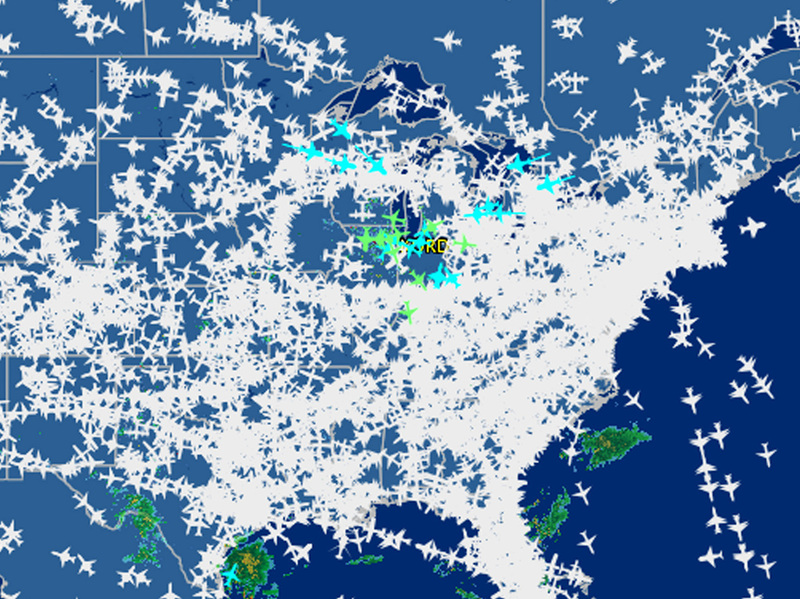 A screen shot provided by FlightAware shows airline traffic at 10:20 a.m. EDT Friday over the United States. A fire at a Chicago-area air traffic control facility grounded hundreds of flights. Flights in and out of Chicago's two airports came to a halt Friday morning after a fire at an air traffic control facility. As of early Friday afternoon at least some of the flights had begun taking off and landing, reports NPR's David Schaper in Chicago. The Associated Press says: "The fire started in the basement of the Chicago Air Route Traffic Control Center in Aurora, about 40 miles west of downtown Chicago, city of Aurora spokesman Dan Ferrelli said in an emailed statement." The Chicago Tribune quotes police as saying the fire was deliberately set but "is no terrorist act." The Trib quotes Aurora police Chief Greg Thomas as saying that the incident appears to be "a local issue with a contract employee and nothing else." Flightaware.com reports that as of 9:20 a.m. CDT (10:20 EDT), more than 800 flights at the two airports had been canceled. Flightaware.com CEO Daniel Baker says "major airlines, regional flights, foreign air carriers, cargo companies and all flights in and out of these airports" have been affected. At 6 a.m., the Chicago Department of Aviation issued a statement saying it had been notified that the Federal Aviation Administration tower in Aurora had been evacuated because of fire. "Both O'Hare and Midway International Airports are in a ground stop, meaning no arrivals or departures," it said. At Midway, Southwest Airlines has suspended flights until noon, the statement said. The AP says that at O'Hare's Terminal 3, long lines formed at ticket counters. Bloomberg reports that airlines have started warning customers to expect cancellations on Saturday. "'We will have cancellations tomorrow,' American Airlines Group Inc. spokeswoman Leslie Scott said. The airline is working with the FAA to determine which flights will be able to go as scheduled, she said. "United Continental Holdings Inc. anticipates delays and cancellations through the day Saturday. The airline is operating with a 'very restricted schedule,' said a spokeswoman, Megan McCarthy." Citing "officials familiar with the matter," Reuters reports that the damage air traffic control facility was so extensive that it "could take days" to restore "the full function of the center."